The Feast of the Seven Fishes is an Italian Christmas Eve tradition. The Feast of the Seven Fishes is an Italian Christmas Eve tradition. Here, 7 of F&W's best seafood recipes to make tonight. This bright dish makes for a dramatic centerpiece. This aromatic Mediterranean stew from San Francisco chef Mark Sullivan gets a distinctly Sicilian sweet-savory flavor from raisins and olives. This dish has all the complex flavors of traditional North African cuisine, yet it’s surprisingly simple. Spinach takes the place of butter to lighten this super satisfying Southern dish. To keep fillets intact, chef Anita Lo of Annisa in New York City wraps them in grape leaves. 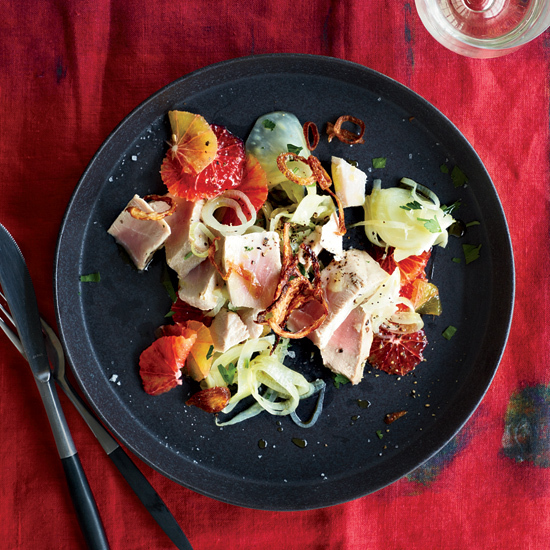 Decadent tuna is cooked in fennel, shallot and orange-spiked extra-virgin olive oil. A copper pan works especially well here as the fennel is cooked until silky over long, low heat.